Growers are encouraged to report any trespassing on their property to Crime Stoppers or local police – not only to discourage illegal activity, but also to prevent the spread of diseases including Panama Tropical Race 4. ABGC has again been alerted to instances of people entering North Queensland banana farms without permission, including on quad bikes and motorbikes. In light of this, ABGC has continued raising awareness of this issue in the community – you can read the statement sent out to local media here. Under Queensland law, anyone caught trespassing onto private land can face a significant fine or even jail time. · Are your footbaths free from soil and organic matter? Note – dirty footbaths don’t kill Panama TR4! · It’s good to have a farm gate sign but if there’s no number, people can’t call you. Make sure your number is up-to-date and easy to read. · Are your zones working to keep clean and dirty areas separate? Do you need to trial some new zoning practices? For more hints and tips, download the Banana Best Management Practices here. If everyone does their bit we can help stop the spread of Panama TR4. The Australian Banana Growers’ Council is currently on the lookout for a Best Management Practice Coordinator. A new project, funded by the Queensland Government, aims to increase knowledge and adoption of BMP banana farming. The Coordinator would lead and report on all aspects of this, including managing the day-to-day operation of the Reef Extension team. If you are keen to drive change, deliver water quality outcomes and support growers within this vibrant industry, view the full job advertisement here. Applications close 4 February, 2019. For more information, contact Strategy Manager Michelle McKinlay on 07 3278 4786. Hort Innovation is currently in the process of developing a new Strategic Plan, due to replace the current one in mid-2019. Growers and members are invited to share their thoughts on how the organization should invest levies at a series of workshops around the country. A full list of dates and questions for consideration can be found here. Tate Connolly has been appointed as the new Hort Innovation Marketing Manager for the Australian Banana industry. Previously to Hort Innovation, Tate spent ten years in foodservice marketing including Nando’s and Wagamama where she held roles in Brand Management, Strategy and Communications. “I’m really excited to be working on the Banana Marketing Program and to learn even more about the industry. I have a real passion for fresh produce.” Tate said. Natural Disaster Declarations have been extended to include the Mid North Coast of New South Wales, in relation to a severe weather event on December 20. The full list of declared areas and details of disaster assistance can be found here. To apply for a concessional loan or freight subsidy, contact the NSW Rural Assistance Authority on 1800 678 593 or click here. We’re on the lookout for the next generation of the banana industry! ABGC is producing video content for our website, Congress and social media. If you know a young adult stepping into the family business (or starting their own), a teen who helps out on the weekends or even an enthusiastic little one, we’d love to hear from you. Contact Sonia Campbell on 0428038330 if you, or someone you know, would like to be involved through a photo or short video. 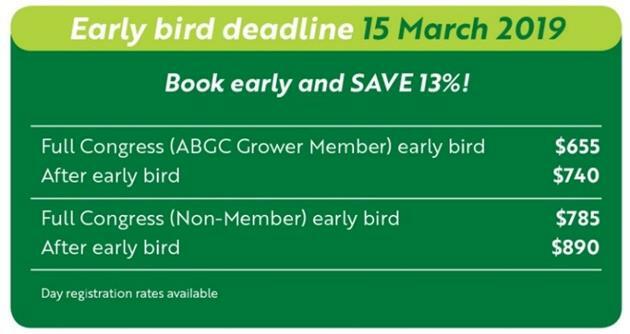 Early bird registrations for Congress 2019 are open – book now and save 13 per cent on what’s shaping up to be a fantastic event. To be held at Royal Pines Resort on the Gold Coast (May 22-24), you can expect dynamic, grower focussed plenary sessions – and some exciting social opportunities to boot. All the details here. A final report into the integrated management of yellow Sigatoka and other diseases in North Queensland will shortly be available on the revamped Hort Innovation website. The report will be housed in the Research, Reports, Fact Sheets and More section, which contains a range of resources for growers and other industry stakeholders. The yellow Sigatoka project – BA15003 – supported the work of Yellow Sigatoka Liaison Officer, Louis Lardi, in educating growers about the disease, as well as leaf speckle (‘leaf spot’). Mr Lardi assisted growers to voluntarily keep levels below recommended levels and achieved a 97 per cent compliance rate.